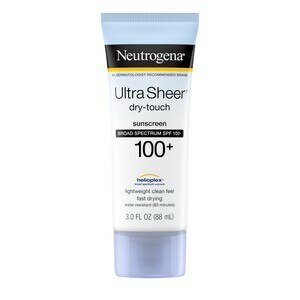 Help get powerful sun protection without the heavy finish with Neutrogena Ultra Sheer Dry-Touch Sunscreen. This Broad Spectrum SPF 100 sunscreen lotion with Dry-Touch technology absorbs excess sunscreen oils for a clean, ultra-light feel and shine-free finish. The formula also features clinically-proven Helioplex, an advanced sunscreen technology with superior broad-spectrum protection from skin-aging UVA rays and skin-burning UVB rays. Fast-absorbing and waterproof, this non-oily formula is non-comedogenic and PABA-free. Active Ingredients:. Avobenzone 3% (sunscreen). Homosalate 15% (sunscreen). Octisalate 5% (sunscreen). Octocrylene 10% (sunscreen). Oxybenzone 6% (sunscreen). Inactive Ingredients: Water, styrene/acrylates copolymer, silica, beeswax, cyclopentasiloxane, ethylhexylglycerin, glyceryl stearate, PEG-100 stearate, acrylates/dimethicone copolymer, acrylates/C10-30 alkyl acrylate crosspolymer, fragrance, chlorphenesin, triethanolamine, diethylhexyl 2,6-naphthalate, dipotassium glycyrrhizate, disodium EDTA, BHT, methylisothiazolinone.